8/8 – When I find myself starting to feel like I have tons of clothing but nothing to wear – I use a capsule wardrobe trick to help me get more creative with what I already own. My “trick” is that I pick out a small number of clothing pieces that mix and match with each other and try to see how many different outfit combinations I can come up with. Many times I get stuck thinking that certain items go together like they are almost a permanent set – “that blue shirt goes with that floral skirt” – and forget to look for other less obvious outfit possibilities. When I start to think beyond my normal routine I get to the new fun outfits I wouldn’t have considered. I have learned that by picking a few favorite & versatile pieces of clothing I can mix and match the items into a surprising number of outfit options. You just have to do a little planning up front. Hopefully the posts this week will show you my method and help you find the potential of the clothes you already have in your closet! 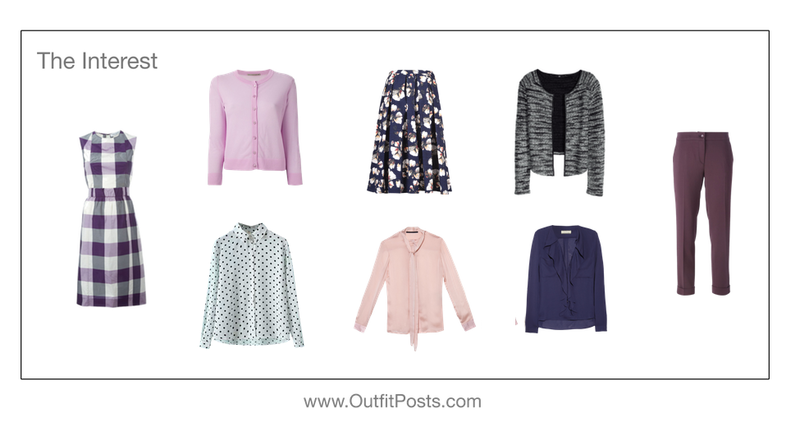 Basics – First I picked some basics pieces to lay the foundation for the capsule wardrobe. For basics, I try to pick my favorite go-to clothes. Clothes I know I wear over and over. The ones that go with almost everything. For this capsule, I picked a neutral palette of greys & blacks. 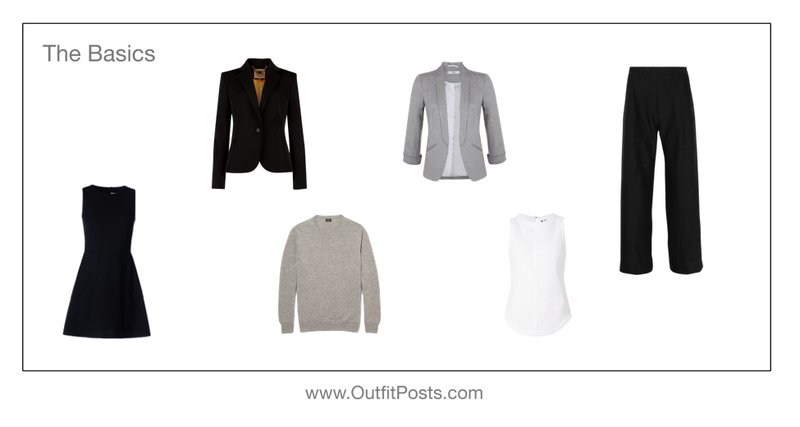 The basics in this capsule wardrobe I chose are a black suit, black wool dress, grey jacket, grey sweater and white shell. Interest – Second, I added a few interesting pieces to compliment the subtle basics. For interest pieces, I look for pops of color or fun patterns or even texture that will make the basic pieces more exciting. I try to grab items that will compliment each other or at least be somewhat in the same color scheme. For this capsule I tried to stick to purple, burgundy and navy. For this set of interest pieces I picked one polka-dot blouse, two textured blouses (a tie & a ruffle), a print skirt, a print dress, purple ankle pants, a lilac/purple cardigan and a boucle jacket. 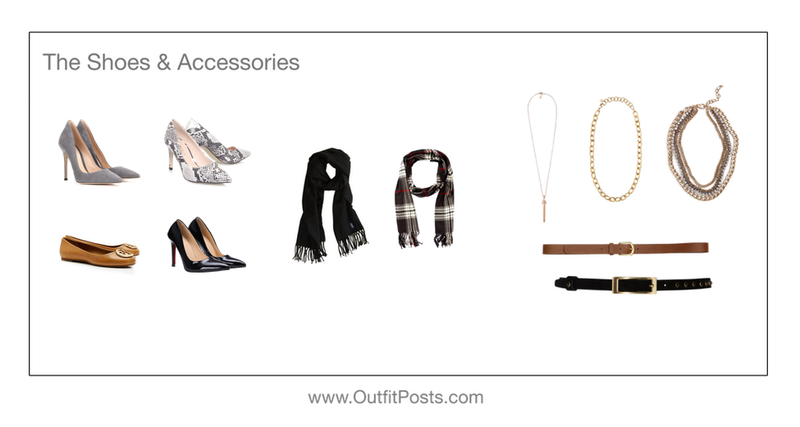 Accessories & Shoes – Finally, I add some accessories to complete the outfits. Jewelry, belts and scarves can dramatically alter how an outfit looks. Unfortunately, shoes is the area I still struggle with. I always want just one more pair. For this capsule wardrobe I chose three necklaces, one gold bracelet, two scarves and two belts. For shoes I chose grey pumps, snakeskin pumps, black pumps and brown flats. Over the next seven days I’m going to show you 30 outfits that I put together with these 14 pieces. I will share four outfits each day listing what pieces they are made from. And then on the last day I will post a big downloadable image that includes the all the individual 14 pieces and all the 30 put together outfits for easy reference. I’ll also put together a printable guide with the same info for easy reference. Hope you enjoy! I love your capsule posts! They really help me to see the possibilities in my own closet. Pinned it- hope you don't mind. Thanks so much for your time, talent, and thought of others. I hope you had a Merry Christmas and that the new year is full of blessings for you. Thank you so much… really helpful to read how you decided. Your ideas will help me figure out my outfits and decide what to purchase to round out my closet. Love your blog!